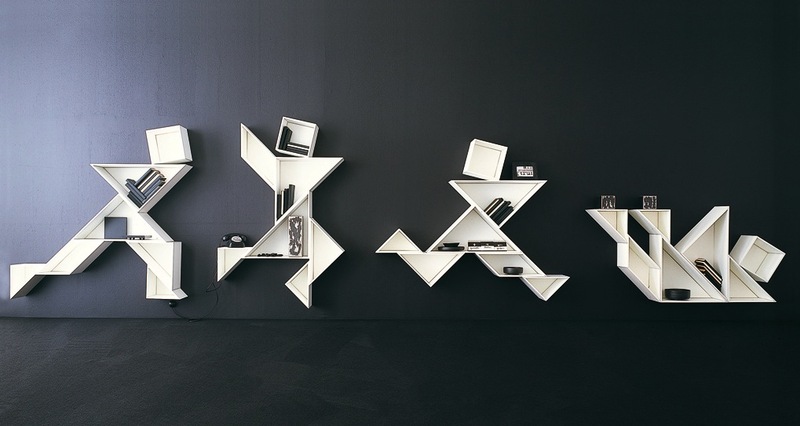 Even arranging and designing furniture (such as the Tangram bookcases shown here) draws on and develops our mathematical skills. In a similar way, we can use wooden blocks, cards, cut-out shapes (including Tangrams), jig saw puzzles, beads, matchsticks, marbles, etc. to investigate many mathematical concepts. Such ‘play’ instils in children the foundations for formal geometry and measurement and an understanding of number. Indeed, the ancient Greeks (among others) played with rectangular numbers, triangular numbers, pyramidal numbers and the like. The beauty of such explorations is that they do not require expensive equipment. I have been known to use twigs or pebbles on the ground when arranging such patterns. There is no need to cut, fold, or modify anything. Let me commend these activities and challenges to you. 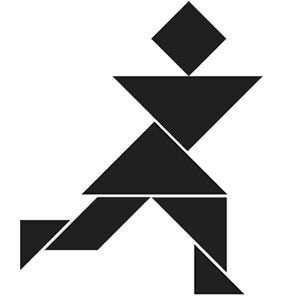 It would be a bit pointless for me to create an entire collection of Tangram material here when there is so much good material on the Internet. A little background, however, could be helpful. The Tangram craze really began when, in 1903, the great American puzzler Sam Loyd published The Eighth Book Of Tan. In it, he included about 700 shapes to copy/reproduce. He also included a fascinating, but totally ficticious, history of Tangrams in which he claimed they were invented 4,000 years earlier by a god called Tan. The craze rapidly spead to other countries. So, what is the Tangram and how do you 'play' it? 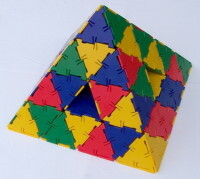 It is simply a game in which you rearrange seven shapes to match some given illustration. 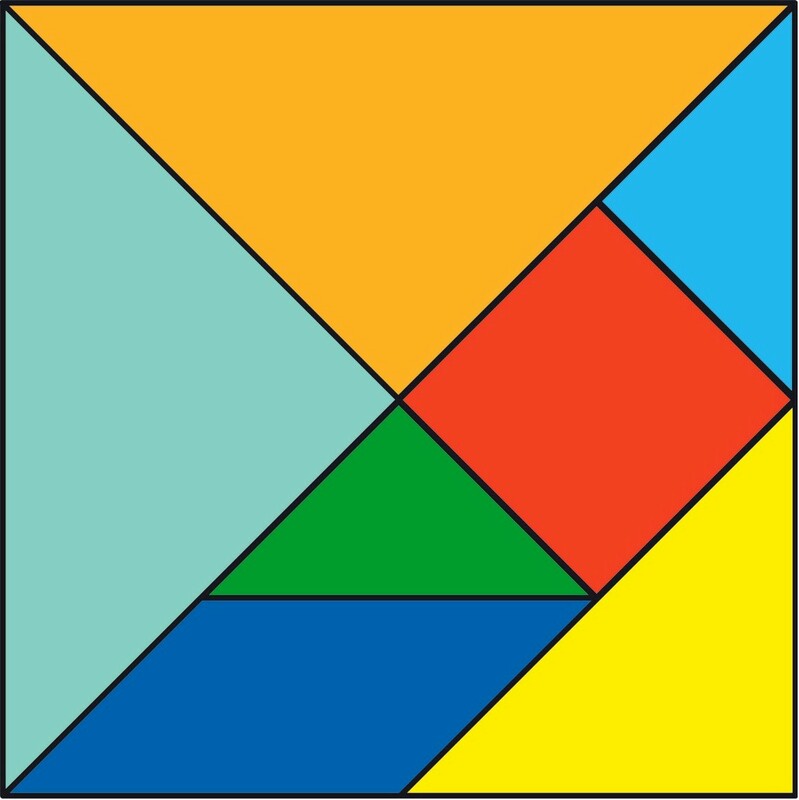 The seven shapes are cut from a square such as the one above. You can purchase a Tangram set (they are made out of a huge variety of materials), or you can make your own, or you could simply click on the image above and print out a pattern and cut it into seven pieces. You then try to arrange them to make pictures like the one at the right (you may need to flip the parallelogram for some patterns). Usually, however, the outlines of the shapes are not provided, and that is what creates the challenge! I mentioned that there are many resources on the Internet. To find them, you could simply Google 'Tangrams', or you could go straight to one site that I found, Tangram Channel, that seems to be very well set up with lots of information and challenges. I was first introduced to Polydrons as a teacher many years ago. I remember bringing a crate of them home in order to play with them, and building some impressive things. As you can see from the images, they are plastic shapes that clip together and come as solid or framed pieces. One of the first things I did was build a pyramid with tunnels through it (as illustrated). I preferred the solid pieces for that task. In the course of my teaching, I have challenged students to build such pyramids, without suggesting any dimensions or giving any hints. I also like asking students to rise to a challenge ... for example, to build a solid with eleven faces, or build a solid with thirteen faces that has no two faces parallel, etc. You can afford to be creative with your thinking and planning with this wonderful resource. 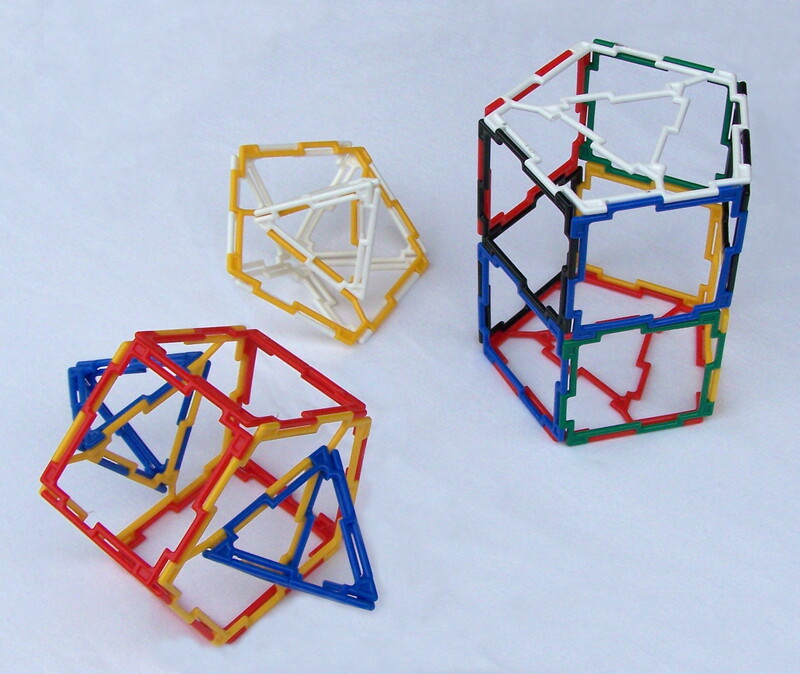 It helps students explore which shapes fit together (and how many of them do so). They can also discover the five Platonic solids in a practical "trial and error" way. Simply provide them with a bin containing pieces of only one shape and challenge them to build closed solids. There is good geometric learning to be had here. The Polydron company has been in business since the 1970s and you may look them up here. I am going to be a bit mischievous here, and introduce you to a not-so-very trivial rearranging puzzle. First, you need to know a little about Sam Loyd (with just one "l"). He was one of the USA's greatest puzzlers/puzzlists and was known for his prolific work as well as some astoundingly clever challenges! 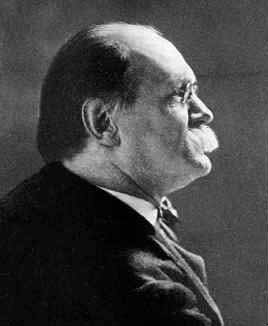 He lived from 1844 to 1911 (the photograph at left was taken of him in 1911, the year of his death). He invented his famous Trick Donkeys puzzle in 1858. It was perhaps the smallest "jig saw" puzzle ever created, with just three pieces, consisting of two mules and two riders! 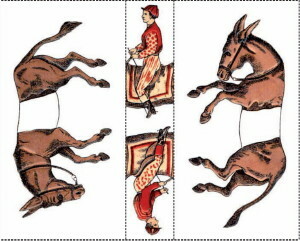 The challenge was to place the cards in such a way that each rider was riding a mule. Some years later, after publishing his Wonderful Chinese Pony Puzzle in 1871, he decided to republish this "jig saw," and called it the Puzzle of the Trick Mules. Apparently, the great businessman and showman, Phineas Taylor (PT) Barnum saw the opportunity to promote his circus using this puzzle card and offered ten thousand dollars to Sam Loyd to change the name of the puzzle to P. T. Barnum’s Trick Mules. 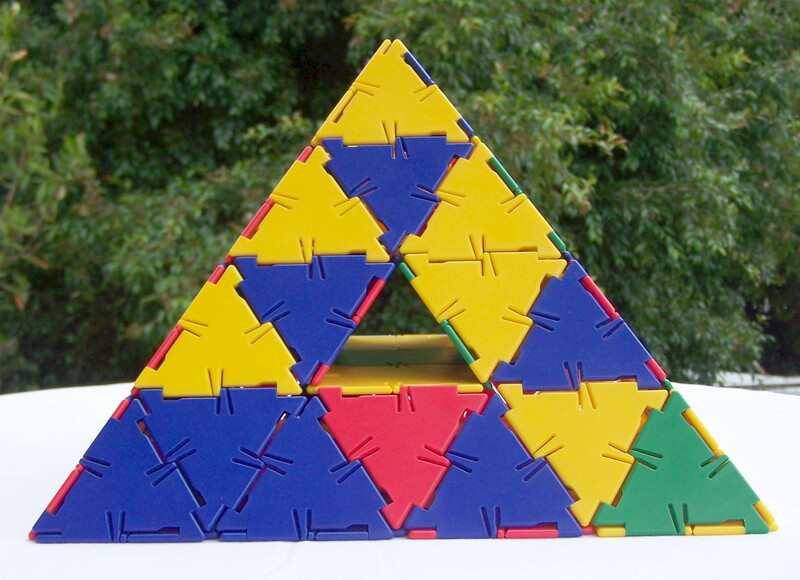 In today's age of videos, computer games, and the Internet it is difficult to credit the amazing enthusiasm with which this puzzle was received by the public. The story is that it was a raging success, with millions of cards sold, and that Sam Loyd earned about $10,000 from the sales (which, according to Wikipedia, was worth about $200,000 in 2014 dollars). Click on the image at right and print out the sheet. Simply cut the image into three pieces along the dotted lines (there is no need to cut around the shape of the mules). 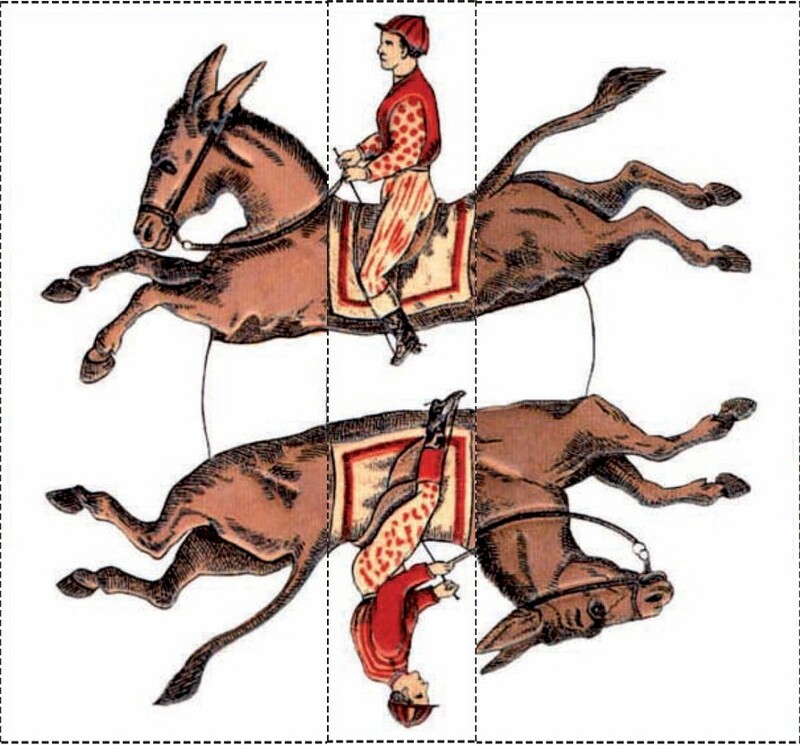 All you have to do is place these three rectangular pieces into position so that it looks as though each jockey is riding a mule. There is no need to fold or cut or tear anything. I believe that, despite so many copies of this puzzle being available on the Internet, that The Sam Loyd Company still owns the rights to the puzzle and intends to release a (replica) commemorative puzzle card in 2016, 145 years after it was first published. Their site is worth a visit! You might like to check out some of Sam Loyd's other famous puzzles ... including the Get Off the Earth Puzzle (be sure to click on the Find Missing Warrior tab to interact with it)! I hope you can appreciate just how ingenious Sam Loyd was ... and how the art of rearranging shapes to make intelligible patterns is not always a trivial exercise. This puzzle is quite an intriguing one. 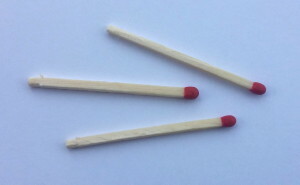 You are given three match sticks. Your task is to place them on a table in such a way that not one of their red tips touches the table. 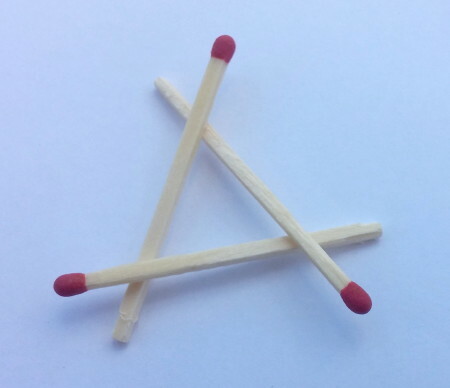 You are not allowed to bend or fold the match sticks in any way. This is purely a matter of cleverly arranging the matches. When you are ready to compare your solution with my one, please click here. How I wish you could be my professor – I have been having a consistent problem with the chain rule for what seems like weeks. I couldn’t grasp it at all. The first couple minutes of your video – it all instantly clicked for me. You are a life saver and a wonderful teacher. Thank you so much for your explanations!!!!!! !